ST PAUL’S Catholic school recently upgraded its school oval and it now boats a fantastic playground facility for students to engage in sport and organised play. 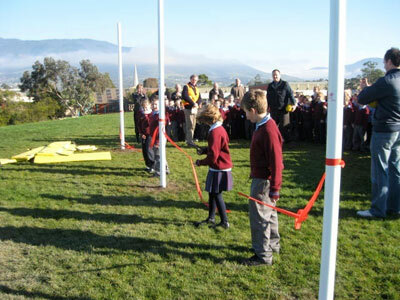 Students at St Paul’s enjoy the ‘cutting of the ribbon’ of the newly refurbished oval’s goal posts. Principal Cameron Brown said it had been wonderful to see so many of the school’s students using the oval for a variety of games and activities. PONTVILLE Oval and stables are getting a $125,000-upgrade to improve accessibility to the grounds all year round. “The State Government is working with the Brighton Council and other stakeholders to develop the Brighton recreation area and enhance the quality of life for residents in the fast-growing Brighton community,” said Labor member for Lyons, David Llewellyn. STUDENTS and staff from Gagebrook Primary School held a Golden Circle School Fun Run recently and raised $1119.20 in vital funds for their school. STUDENTS from East Derwent Primary School and Brighton Primary School recently helped Brighton Council plant trees as part of national tree day 2009. THE first meeting of the Bridgewater School for Seniors took place on July 12 2005 and this year we decided to have an anniversary celebration on Tuesday, July 14. A CELEBRATION of the Co-Pilots mentoring program was held at Bridgewater High in June. The program has enabled students from grade 4 to grade 11 to be matched with trained volunteer adults for one-on-one tutoring in areas of special interest. 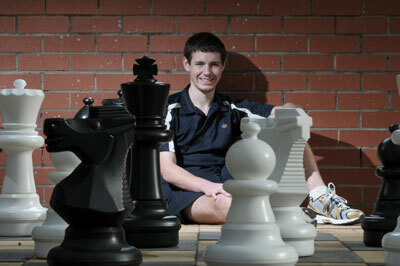 DANIEL Wood from Old Beach recently finished runner-up in the southern inter-school chess competition. Daniel Wood from Old Beach is already considering his next career move. Amazingly, Daniel said he had only been playing chess for 12 months. “This is my best result in a competition,” he said. PREMIER and Minister for Education and Skills, David Bartlett, has opened a new $850,000 materials, design and technology facility at Bridgewater High.